According to recent report by BI Research, it sees little prospect for a significant recovery in Singapore's export growth over the coming year amid poor external demand conditions and ongoing domestic structural difficulties. In line with its expectations for lacklustre real export growth in 2016 (2.2%), it has downgraded it 2015 real GDP forecast to 2.3%, from 2.5% previously. 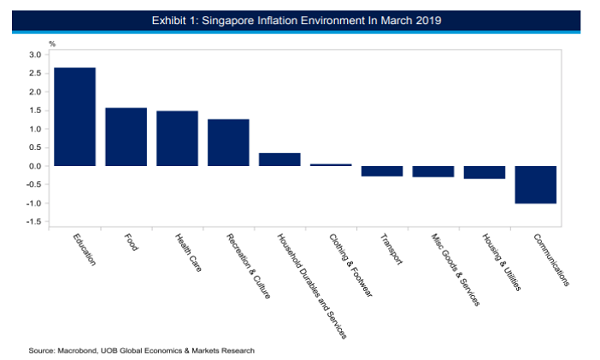 That said, it retains its view that Singapore's underlying economic fundamentals will remain robust as characterised by a healthy labour market and robust real wage growth. Singapore's non-oil domestic exports (NODX) fell back into contraction in October, slipping by 0.5% year-on-year (y-o-y) versus a minor expansion of 0.3% of September. Singapore is facing both a cyclical slowdown in global trade as well as structural domestic difficulties, both of which have acted as a drag on non-oil domestic exports (NODX) and industrial production. Reflecting this difficult outlook, industrial production growth sank to a fresh three-year low of -5.3% y-o-y in October, suggesting that manufacturers continue to struggle in the face of the myriad headwinds. Singapore's largest export market China is in the midst of a protracted slowdown, the effects of which have been reflected in the city-state's shipments to the mainland. NODX to China slipped by 8.7% y-o-y in October, following a 12.9% decline in September, and our expectations for real GDP growth in the region's largest economy to fall to 6.3% in 2016 (versus a likely 6.9% in 2015) suggest that demand conditions will continue to deteriorate. Meanwhile, trade flows to the US have been only marginally better, with NODX to the world's largest economy (and Singapore's second largest export market) falling for the second straight month at a pace of 2.2% y-o-y.